Welcome to a beautiful home in Vreeland, the Netherlands. It is an excellent example of the simplicity of modern design that is also of a higher aesthetic grade. 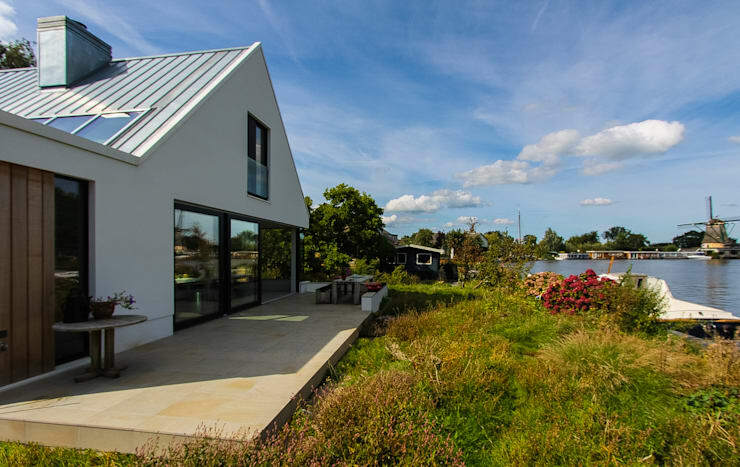 This building is brought to us by ScanaBouw, a firm of home builders based in Huissen. The firm’s philosophy revolves around the idea that building castles in the sky will bring you nowhere. That is why they will make sure that your budget, ideal home size, plot planning, and statutory building size are all in order to obtain your dream home, just where you want it. They then move forward to an architectural draft and will not continue until the client is completely satisfied. With such a clear and simple, client-centred approach, we are sure to find a home to make anyone happy. Let’s take a look! ScanaBouw base all of their projects on a wood construction system originating from the Scandinavian countries, as their name implies. These types of structures have been tested for many centuries, often under harsh conditions. The gable-roofed structure allows for a large ground floor social area, as well as an attic space that can be used for more intimate areas. 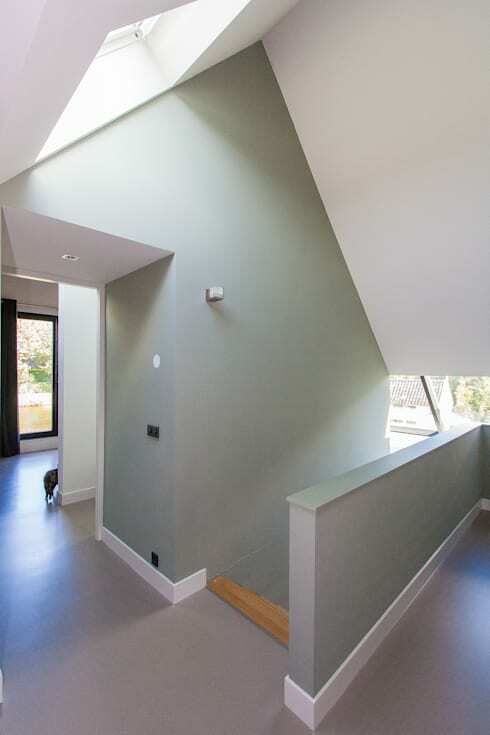 Here we also see a protruded window to extend the top floor area and allow more natural light to enter the home. One of these houses can also be available to you in no time at all. A home can be wind-proofed and water-proofed within a few weeks. For ScanaBouw, sustainability is not a trend, it has always been a matter of fact in their buildings since their inception. Wood, by nature, is an environmentally-friendly material, and an excellent insulator to boot. It is also a flexible material to work with in construction, and can therefore adapt beautifully to contemporary design standards. 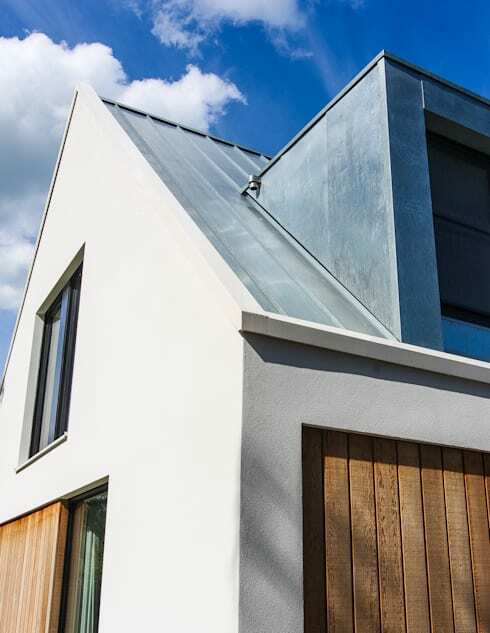 A highly isolated timber frame with triple glazing is the secret to the structure’s success, ensuring a durable frame that is also eco-conscious. ScanaBouw is certified by the FSC (Forest Stewardship Council), ensuring that the firm is committed to responsible management of our planet’s precious forests. The space inside the house is as clean-cut as the exterior areas. The light, cool colours extends the perception of space of the home. Laminate floors ensure a warmer atmosphere, whilst the material remains super durable and easy to maintain or clean. Laminates are becoming more and more popular in modern homes, and here we can see it can be a very stylish addition. 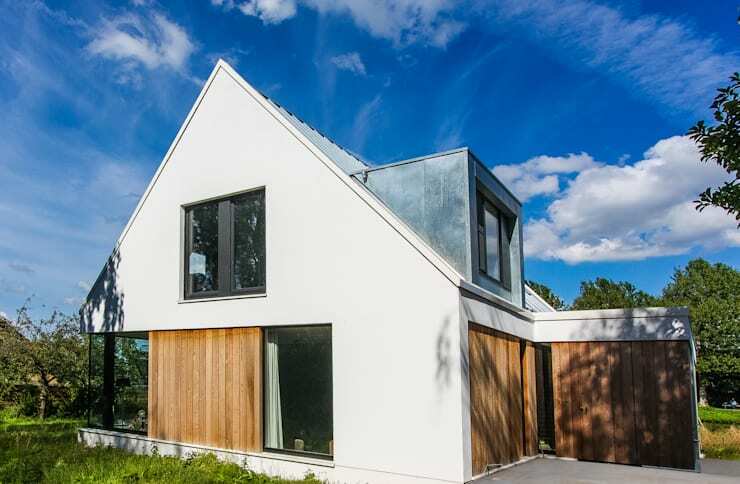 Due to the low construction costs of ScanaBouw houses, in addition to the high quality insulation of the structure, inhabitants are ensured continued low housing costs. What’s more, the company offers a range of options for structures, including the possibility to build your house, or part of it, yourself with the parts they provide. Welcome to the kitchen of this charming home. This space is well-planned, and its advantage lies in the strategic arrangements of the fixtures. Two strips of kitchen counters are separated by a narrow strip of free space. 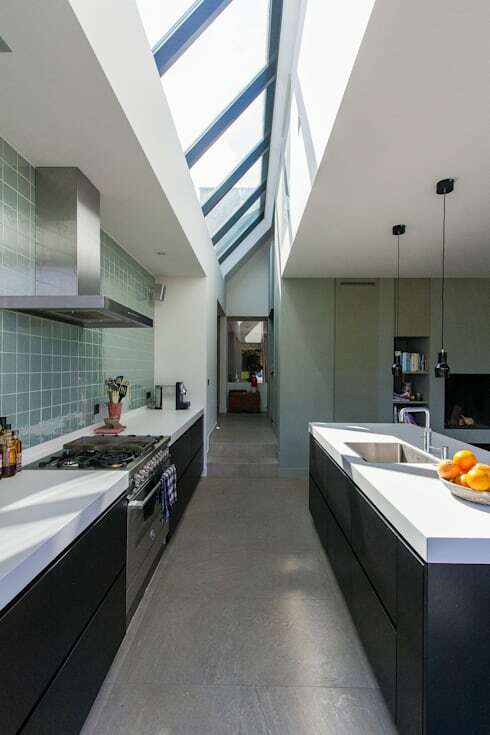 Above this free area, we can see a skylight the length of the kitchen. This is perfect placement, as it allows for the task space to be lighted from outside. More savings on the electrical bill? The flooring in the kitchen area consists of large stone tiles in a grey hue. The kitchen counters consist of charcoal-coloured cabinets, topped with white laminate counter tops. The backsplash tiles are in a light teal colour with a glossy top coat. This soft tone is fresh and airy, ideal for the kitchen space that may get hot and humid with cooking at times! Up to the family bathroom. We can see that this room is fit on the top floor—the attic under the sloped roof. 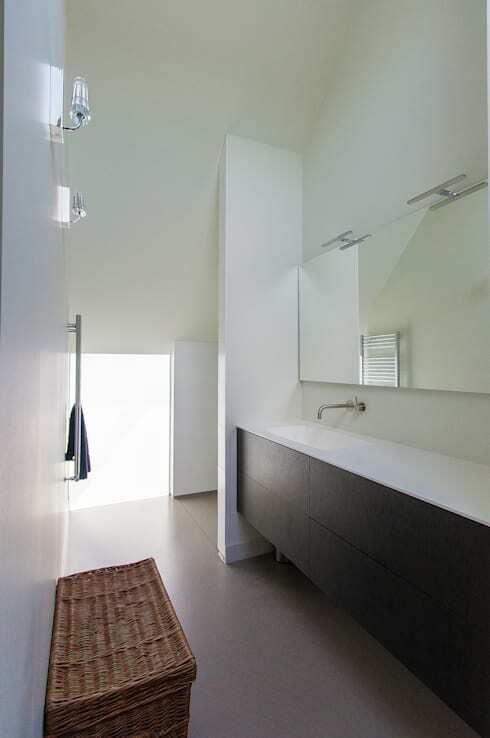 This location does not, however, make the space feel small or constrained, since the ceiling and walls are all white to expand the perceived area. This room also has laminate flooring, but here it is in an earthier tone. This brings a more natural and spiritual atmosphere in an intimate space where one can go to relax and unwind. The counter in which the bathroom sink is located, is based on charcoal cabinets similar to those seen in the kitchen counters. In this manner, a sense of continuity is created throughout the home. Stylish silver features adorn the space to add a sense of sophistication. At last we take a walk out onto the home’s porch. This simple cement slab serves as a wonderful spot for outdoor dinners and entertainment. It overlooks a tranquil pond in a scenic landscape. The grass and plants around the home are all of a wild variety, ensuring a sense of closer connection to nature and a homier feeling. This is aided by the uninhibited growth of this vegetation. The porch offers panoramic views over the pond and the surrounding landscape. What this wood structure offers, is a calm and relaxed atmosphere inside the house as well in its geographic location. The home is certainly a minimal haven for the modern age! What do you think of the kitchen's colour scheme? What is your favourite part of this house? We'd love to hear your thoughts!